Michael Dunlop made it two out of two at the Southern 100 by edging out Dan Kneen by 0.12 seconds in Wednesday night’s seven-lap Senior race. In the Senior race Dunlop also set a new race record pace and also a new lap record at 114.130mph on his final circuit in the Isle of Man on the Bennett’s Suzuki. Jamie Coward was third, with James Cowton, Ivan Lintin and Rob Hodson making up the top six. Manxman Kneen was also edged out by Dunlop in Tuesday’s 1,000cc race. “Dan is riding hard, fair play to him. It was a good tight race in great conditions. I just hit a back marker in the wrong place on the last lap but I held on to win,” said Dunlop. Dean Harrison won the 600cc race ahead James Cowton. Harrison had the added bonus of a new lap record with 110.762 on his final circuit. 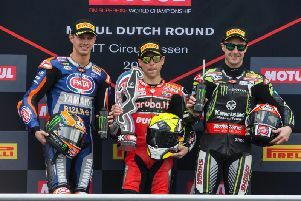 Lintin secured a fifth consecutive win in the Supertwins class and the sixth of his career at the meeting by pipping Cowton on the line by 0.3 seconds. Rob Hudson completed the rostrum, with event debutant Joe Thompson the first 250cc home. Brothers Ben and Tom Birchall took their first sidecar win since 2012 by seeing off John Holden and Lee Cain. Wayne Locker and Mark Sayers were third.